This guide is based on the exchange Kraken.com. We chose Kraken because many other exchanges have put a temporary stop to registering new users, as the amount of new traders has increased greatly. Next to this, Kraken has also been an exchange with a sizeable volume, many altcoins, and the possibility to exchange cryptocurrencies for Euros. If you haven’t created an account on Kraken.com yet, do this. Create a unique password unlike any you’ve ever created or will create, and store this safely. For example within a password manager like KeepassX. Login to your Kraken account. To deposit fiat on your account, you must first enter some data in accordance with the KYC laws. This means entering your name, address, and more information to identify yourself. To do this, click ‘Get Verified’. Then scroll down to enter the fields under the tabs ‘Tier 1’ and ‘Tier 2’. Enter correct and verifiable information, and use the same information that you’ve entered at your bank. As soon as you’re Tier 2 verified, you can deposit money to Kraken. This goes through (among other things) a SEPA transfer and it usually takes between 4 to 48 hours, on weekdays. 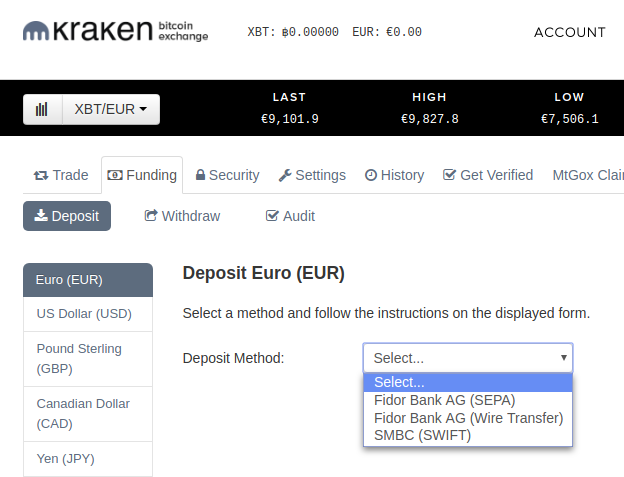 In the menu, click on ‘Funding’ and then choose the currency you wish to deposit on your Kraken account, on the left hand side. Then select a depositing method. In this example we’ll use ‘Fidor Bank AG (SEPA)’. Select this method. This screen shows the instructions for your deposit. READ THIS WELL. You have to deposit from a bank account that matches the personal information you’ve entered into your Kraken account. This is why the verification process during step 2 needs to be completed. When depositing to this account, you also need to enter the correct reference, including ‘kraken.com’ at the end. Deposit an amount to the IBAN account number of Kraken from your personal bank account with the correct reference. This information can be found on the page after selecting the deposit method ‘SEPA Deposit – Fidor Bank AG (SEPA)’. If you want to deposit multiple times to your Kraken account, always utilize different amounts. Experience shows that depositing the same amount twice, can slow down the second deposit. Depending on the transaction speed of the bank, the amount will be transferred within several hours or days onto your Kraken account. You’ll receive an email as soon as the transaction has been completed. In the menu, click on ‘Trade’ on the upper left side. You can now select on which of the available markets you want to trade. In this example we’ll trade Euros for Bitcoin (XBT/EUR). On Kraken you’ll find other trading pairs like Litecoin/Euro market of ETH/EUR-market; these can be viewed from this menu. Conversely, this page can also be used to transfer Bitcoin to Euros and deposit this on your bank account. When you’ve selected the market you would like to trade in, click on ‘New Order’. On this page, you’ll be met with several ways of placing an order. First you’ll see three options: ‘Simple’, ‘Intermediate’, and ‘Advanced’. In this guide we’ll choose the ‘simple’-route. The other routes are for more advanced traders and contain options for margin trading with leverage. On this page you can enter several fields. How many Bitcoins you wish to buy, for what price per coin, or what the total amount is you’d like to spend. The automatically filled in number, is the actual current price of Bitcoin in Euros. You can adjust this if you’d like to buy Bitcoin for a specific price. You can also press the button ‘Market’ (next to the current value). If you do this, the best possible current price of Bitcoin will be used to buy. 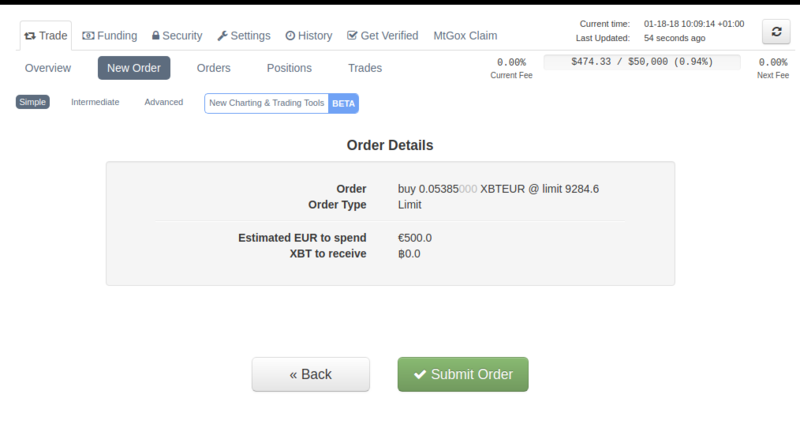 In this example we’ll create a ‘limit order’ to buy Bitcoin for the most current price. Enter a value that you want to trade for Bitcoin in the field ‘Total’. In the entry field on the left, you’ll see how many Bitcoins this amount will net you. 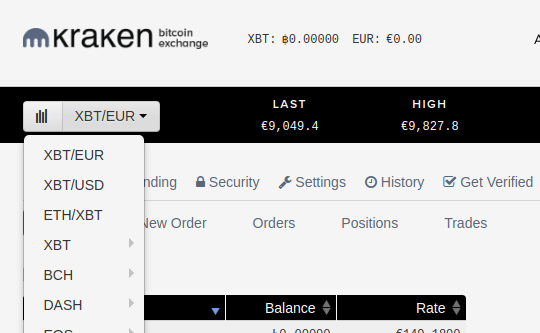 Now click the button ‘Buy XBT with EUR»’. Now you’ll be shown an overview of the order you entered. If you click in ‘Submit Order’, the order will be placed in the order book and – if there are Bitcoins available for the price entered – it will be executed immediately. If the Bitcoin price just increased, the order most likely won’t be fulfilled. In that case you can wait to see if the price will drop back again, or you can cancel the order and place a new order for the current price. To cancel an order, go to the bottom of the page under ‘New & Open Orders’. At the top of the menu you’ll find the button ‘Orders’ which will also lead you to a page with all your current orders. When the orders are executed, your Euros have been converted into Bitcoin. You can see the amount of Bitcoin under the page ‘Funding’ by clicking on ‘Bitcoin (XBT)’ on the left hand side. Here you can also withdraw Bitcoin to transfer to your wallet or another exchange. You can do this by clicking on ‘Withdraw’ and then clicking on ‘Bitcoin (XBT)’ on the left hand side. If you want to withdraw your bought Bitcoins, you’ll have to add an address to send it to. You can do this by going go ‘Funding’ → ‘Withdraw’ → ‘Bitcoin’. Then click on ‘+ Add Address’ and enter a Bitcoin address and description. Be wary that you enter the correct information, because it is impossible to retrieve when sent to an incorrect or non-existing address. In that case, you’ve lost all the transferred currency.